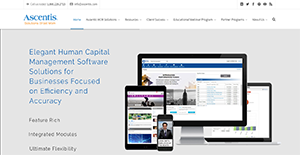 Ascentis is a fully-featured human capital management software with integrated modules that provide the utmost flexibility. The program is geared towards middle-sized businesses to assist them in saving time and money by automating and streamlining the most important parts of their operations. With Ascentis, companies can choose to work with one or two modules or go full throttle with the entire software suite. No matter which choice they make, they gain access to features that enable them to provide solutions to their HR departments for highly-organized processes. Also, Ascentis ensures that organizations operate within the bounds of the rules and regulations set by the ACA. This gives them peace of mind that they are offering benefits to their employees according to the standards of the institution. One of the modules of Ascentis is its HRIS. This particular module of the software is wizard-driven, which means many aspects of it are partially or fully automated and users are guided through every step. This allows businesses to bolster their employee engagement, capture and track relevant data, analyze insights and trends, and more while manual handling of operations is eliminated thereby decreasing the instances of human errors. Ascentis also saves companies the trouble of manually relaying information to their insurance carriers. The software’s Carrier Connect ensures that data are automatically and securely transferred to eliminate paperwork and to reduce dual entry and other errors. With Ascentis, businesses can decrease the rate of turn-overs by training employees. This way, not only do employees gain more skills and capabilities, they can also apply those to their positions and settings. Furthermore, the Talent Management System module also enables managers to identify their top performers and use them as an example to assist other team members to. This helps them build bridges where there are gaps by enabling under-performers to do better. By doing all tasks related to payroll on the web, the HR department and the finance team can accurately and efficiently calculate salaries in real-time and on time. With the assistance of Ascentis, they are also able to lessen the time they spend on the payroll by 30% at most. With Ascentis, companies also need not fear that their financial data are accessible to unauthorized personnel or outsiders. Their information is highly-encrypted and there are firewalls that further protect the numbers from all kinds of threats. Ascentis has an optional module that enables employees to take ownership of their personal information and benefits. Through this portal, they can manage their data by accessing them and editing them as needed via the web. Not only does this ensure that they have transparency, it also eases the burden on the HR. Ascentis assists recruiting managers in overseeing job applications every step of the way. They are able to gain access to complete records regarding certain applicants and also focus more on more pressing matters because of automated steps. Moreover, Ascentis provides companies with branded career portals that afford them more visibility to job seekers on the web. On top of that, they can customize it in a way that they can pre-screen candidates to filter only the best talents. Ascentis also affords companies the ability to rigorously and accurately track employees’ time and attendance. This allows them to save money on unnecessary overtime work and also enables them to push their employees to be more productive during work hours to avoid after-hours tasks. Additionally, Ascentis’ time and attendance tracker works on myriad devices. This lets companies choose the method that is most appropriate for their kind of work without sacrificing accuracy. With Ascentis, companies can leverage their strengths and boost their compensation and benefits packages to attract top talent. That is because the software provides them with a way to know how they are doing against the competition when it comes to different aspects. From there, they can make more informed decisions to gain more visibility among the best professionals. Since Ascentis is a cloud-based software, implementing and integrating the application to the company’s workflow is a seamless one. The process takes only a few weeks to fully set-up and offers an understandable delineation of who is responsible for what. This allows stakeholders to be informed at all times and to make certain that deadlines are met. If you are considering Ascentis it could also be beneficial to analyze other subcategories of Best Applicant Tracking Software listed in our database of B2B software reviews. Every business has its own characteristics, and might need a specific Applicant Tracking Software solution that will be adjusted to their business size, type of clients and staff and even particular niche they support. We advise you don't count on getting a perfect solution that is going to be suitable for every business regardless of their background is. It may be a good idea to read a few Ascentis reviews first and even then you should keep in mind what the software is supposed to do for your business and your workers. Do you need a simple and intuitive service with just basic features? Will you actually use the advanced tools required by experts and large enterprises? Are there any particular features that are especially useful for the industry you operate in? If you ask yourself these questions it will be much easier to locate a trustworthy solution that will fit your budget. How Much Does Ascentis Cost? Ascentis’ SMB and enterprise pricing information is available only upon request. Contact the company for more details, and ask for your quote. We realize that when you make a decision to buy Applicant Tracking Software it’s important not only to see how experts evaluate it in their reviews, but also to find out if the real people and companies that buy it are actually satisfied with the product. That’s why we’ve created our behavior-based Customer Satisfaction Algorithm™ that gathers customer reviews, comments and Ascentis reviews across a wide range of social media sites. The data is then presented in an easy to digest form showing how many people had positive and negative experience with Ascentis. With that information at hand you should be equipped to make an informed buying decision that you won’t regret. What are Ascentis pricing details? What integrations are available for Ascentis? If you need more information about Ascentis or you simply have a question let us know what you need and we’ll forward your request directly to the vendor.